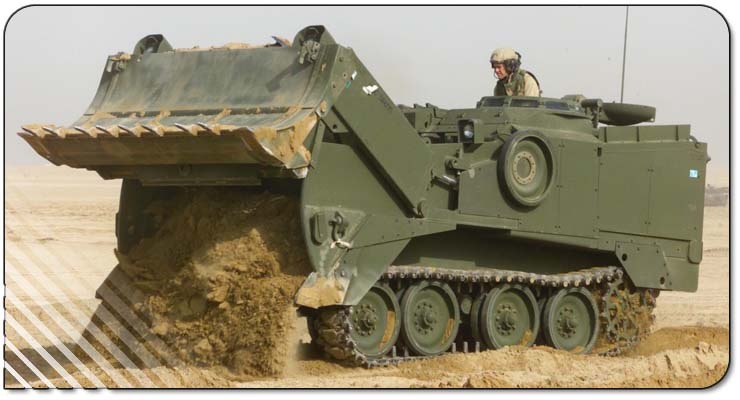 Features: The M-9 Armored Combat Earthmover is a highly mobile, full-tracked, air transportable armored earthmover and represents a significant enhancement to the combat engineers' capability to support the MAGTF. The M-9 ACE can be employed in a host of engineer tasks, such as clearing obstacles, preparing defilade and survivability positions, and a myriad of engineering construction tasks including dozing, scraping, grading, hauling, towing, and winching. With the combination of its cross-country mobility and armored protection, the M-9 ACE is capable of both offensive and defensive operations in the forwarded battle area. Additionally, with a cruising range of 200 miles, air transportability, and the ability to swim, the M-9 ACE can maintain the momentum of the maneuvering forces. Background: The M-9 ACE is currently in production and is in the process of being fielded to the FMF. Fielding for I MEF units (7th ESB and 1st CEB) and the EEAP at the MCAGCC, Twenty-nine Palms was completed in Jul-Aug 1995. Fielding for the II MEF units (8th ESB and 2d CEB) was completed in Sep 1995. Fielding of the M-9 ACE to the remaining units designated to receive this vehicle, including MARRESFOR units, III MEF units, and the Marine Corps Engineer School at Fort Leonard Wood, is scheduled for the first and second quarters of Fiscal Year 1996.